For weeks, the Patriots have been struggling in the red zone, failing to convert short fields into touchdowns. On Sunday, their troubles expanded to the entire field. New England’s offense looked as lifeless as it’s ever been in the Tom Brady-Bill Belichick era in a 34-10 loss to the Tennessee Titans in Nashville. All of this despite not turning the ball over. Not that the defense helped matters, either, as Titans quarterback Marcus Mariota and the rest of Tennessee’s offense had their way all day long. The Titans scored on the game’s first drive, with Mariota completing a 4-yard pass to Jonnu Smith to cap off a ridiculously easy seven-play, 40-yard drive. Stephen Gostkowski kicked a 52-yard field goal on New England’s opening drive, only for Tennessee to march right back down field with a nine-play, 78-yard scoring drive which culminated in a Corey Davis 23-yard touchdown reception. Davis was a monster for the Titans all game long, hauling in seven passes for 125 yards while routinely beating Stephon Gilmore in coverage. James Develin had a 1-yard touchdown run to pull the Patriots within 17-10 early in the second quarter, but the Patriots would get no closer. Tennessee made it a two-score game 1:09 shy of halftime on a Derrick Henry 1-yard touchdown run, kicked a field goal in the third quarter, and put an end to any shot of a New England comeback with another Henry run in the fourth. Things got so bad for the Patriots that Brian Hoyer replaced Brady midway through the fourth quarter with the outcome of the game long since decided. 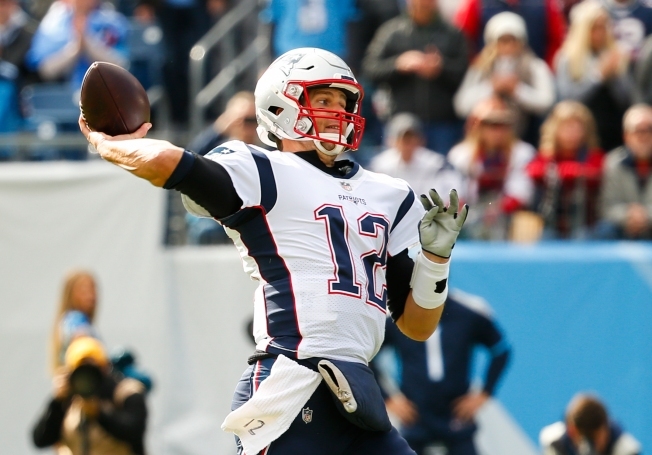 Brady completed 21 of his 41 passes for 254 yards, good enough for a passer rating of just 70.6 -- his second-lowest of the season following a similiar debacle in Detroit. Mariota, meanwhile, shined for the Titans. He was 16 for 24 for 228 yards and the two touchdown passes, and even added a catch for 21 yards. The Patriots hardly targeted former cornerback Malcolm Butler, who started the game for his new team despite struggles in recent weeks. Dion Lewis, another former Patriot, was also relatively quiet with 57 rushing yards and just two catches for 11 yards. Tennessee, of course, is coached by former New England linebacker Mike Vrabel, who spent eight seasons with the Patriots from 2001 to 2008. The Titans entered the game as owners of the NFL's top scoring defense, giving up an average of 17.6 points per game; that number will go down after embarassing New England. Rob Gronkowski and Shaq Mason were inactive for New England, while the team dealt with injuries to Trent Brown, Marcus Cannon, Dwayne Allen and Julian Edelman over the course of the game. It was the worst loss for the Patriots since Week 4 of the 2014 season, when New England infamously lost to the Kansas City Chiefs on the road, 41-14. It was on to Cincinnati after that, and the rest is history. What happens next remains to be seen, but the Patriots now have a much-needed bye week ahead. They return to action against the hapless New York Jets on Sunday, Nov. 25 at MetLife Stadium in East Rutherford, New Jersey.